1st Canadian Airline offer Wi-Fi at 30,000ft! 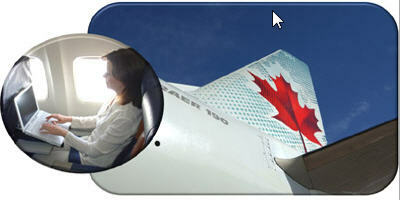 Air Canada has become the first Canadian carrier to offer inflight internet service to its customers. Trial service has begun on the Toronto-Los Angeles and Montreal-Los Angeles routes. The test period will run until January 29, 2010, after which Air Canada will analyze usage and customer feedback to determine whether it will introduce the service on other routes. The Gogo Inflight internet service allows travellers to access the service using their own standard, Wi-Fi equipped laptop at a cost of US $9.95 per flight or Personal Electronic Device (PED) at a cost of US $7.95 per flight. In order to make Air Canada’s rollout fast, economical and simple, initially, the Gogo system will be powered by Aircell’s existing network which is only available in the continental US. The system is expected to rollout on other routes in North America with the deployment of the Canadian Air-To-Ground (ATG) network. Aircell plans to collaborate with the Canadian ATG licensee in supporting the establishment of a Canadian ATG network and in facilitating the fleet-wide deployment of Air Canada’s onboard connectivity service. Working long hours pre-vacation can destroy your sleep, and a study from Mount Sinai School of Medicine found that poor sleep before a stressful event reduces immune-system function. Save your vacation: Starting a week before you leave, drink about 20 ounces of black tea daily. A study published in Proceedings of the National Academy of Sciences revealed that this causes the body to secrete two to four times more interferon, a key element of your body’s infection-protection arsenal. At 8,000-plus feet in elevation, reduced air pressure and lower oxygen levels can induce headaches, nausea, dizziness, and in severe cases, pulmonary edema (fluid in the lungs). Save your vacation: Before you leave, ask your doc for acetazolamide, a drug that helps your body metabolize more oxygen. In a study, people who took 250 milligrams twice a day after traveling from sea level to 12,000 feet relieved all symptoms. Take it a day or two before departure and continue until 48 hours after you arrive. Time-zone changes and poor eating can alter your normally clocklike bowel movements. “We often leave our healthy diets behind, which stresses our digestion,” says Mark Wise, M.D., author of The Travel Doctor. If your body’s motion detectors sense movement differently (e.g., your view of the cabin stays the same but your inner ear senses a drop), motion sickness is likely to ensue, according to the American Academy of Neurology. Save your vacation: Have a burger. The right preflight meal can soothe your stomach. A Pennsylvania State University study found that subjects felt up to 26 percent less nauseated when they ate a protein-packed meal, compared with a carb-loaded meal or no food at all. Save your vacation: For your nostrils, pack an over-the-counter saline gel, like Ayr. To keep your skin hydrated, drink 20 ounces of water while you’re in flight, says travel-medicine specialist Terri Rock, M.D. Make sure it’s bottled, and buy it after you pass security. The United Nations estimates that 36 percent of drinking water in Africa doesn’t meet quality standards. (It’s 22 percent in Asia and 18 percent in Latin America and the Caribbean.) And the EPA found that 15 percent of water samples taken from 327 planes probably contained harmful pathogens. New International Airport in Mexico Unveiled. It’s not every day that a new international airport is constructed, especially in these economic times, but Puerto Penasco, one of Mexico’s most remote locations, opened its first international airport on Thursday, making commercial access to the region that much easier. Now travelers have access to the Sea of Cortez beaches, wildlife and recreation that once required a drive across desert and mountain terrain to get to. The Mar de Cortes International Airport, launched by Grupo Vidanta, makes the destination less than an hour from Phoenix and less than two hours from Los Angeles, Las Vegas and Albuquerque. With its opening will come hotels, resorts, golf courses, homes and infrastructure. So be one of the first to explore this exciting new region from budget hotel’s to five star properties. WALT DISNEY TO LAND IN SHANGHAI. The Chinese government approved the Walt Disney Co.’s deal to open a theme park in Shanghai. The new park is planned for the Pudong new district of China’s financial capital. Disney will be hoping the Shanghai park, with an estimated price tag of US$3.6-billion, will fare better than its Hong Kong property, which has struggled with lower-than-expected attendance and financial losses since it opened in 2005. There’s never been a better time to share the joy and wonder of Holidays at the Disneyland Resort, beginning November 13. That’s because right now, can save US $400 on an unforgettable 4-day/4-night vacation to the Merriest place on Earth. Now through Dec. 19, 2009, you can save US $400* when they buy a 4-day/4-night Disneyland Resort vacation package. That’s one hell of a big airplane: Air Austral have ordered the first single class Airbus A380 double-decker super jumbos. These are so big they should require capitals – SUPER JUMBOS. The capacity – a massive 840 passengers. Air Austral have ordered two. Based in La Réunion in the Indian Ocean, the carrier will operate the aircraft on the high-density route from La Réunion to Paris. Do we even want to think about how long the line up’s will be for the washroom and don’t even think about how long you have to wait for your checked bag? San Fermin Bull Festival – Pamplona, Spain. The exhilarating Running of the Bulls festival in Pamplona, Navarra, in north central Spain dates back to the 14th Century. 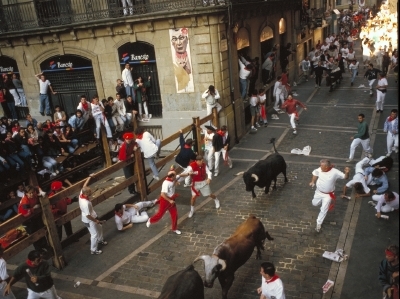 This huge week-long celebration, made famous by Ernest Hemingway, honors the city’s patron saint, San Fermín and includes fireworks, parades, music, dances, bullfights, religious ceremonies and the exciting Running of the Bulls or “encierro” each morning, where brave men and women run with the bulls through the narrow streets of this charming town. Who says Spain is nothing but crowded beaches, Culture, Culture, Culture, Spain has lot’s of that too! 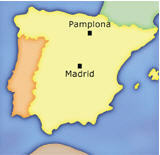 We can quote excellent airfares to Madrid from your local airport. The New Zealand Hobbits Are Back! With pre- production on The Hobbit which is the prequel to the Lord of the Rings movies, Matamata is in the limelight again, where the village of Hobbiton set was made. Well now you can go and visit the site and follow in the paths of your Hollywood Icons, names such as director Peter Jackson, Gandalf (Sir Ian McKellen), Frodo (Elijah Wood), Bilbo Baggins (Ian Holm) and Sam (Sean Astin). Thirty-seven hobbit holes were created made out of wood and polystyrene. Now that all the film crew and movie stars have long gone it’s now your turn to re live the experience and loose yourself in the realm of The Hobbit and the Lord of the Rings world. *Includes fuel surcharge. Excludes Government fees and taxes of up to $90 USD, depending on routing, which encompasses the Passenger Facility Charge of $4.50 and the September 11 Security Fee of $2.50 USD per person per enplanement in the USA to a maximum of $10.00 USD. Taxes are subject to currency exchange fluctuation and may vary from the estimated taxes shown. Other terms & conditions apply. Step aboard into adventure through the Norwegian fjords. From dog sledding on frozen fjords to the elusive Northern Lights, this a rare opportunity to live the legend now at unprecedented value with this spectacular once in a lifetime offer. Usd price per person double occupancy based on cat I for selected 6 day cruises departing Nov09. Bookings to be made by 30nov09, capacity controlled and subject to change without notice. Offer cannot be combined with any other discount or promotion and restrictions apply,port charges &amp; taxes extra, cruise only. We can arrange airfare from your local airport. Prices are quoted per person in US Dollars, based on double occupancy, valid November 1 2009 to October 31 2010 . Not included in the prices are Guatemala exit taxes, payable upon departure from the country. Space is subject to availability. Caribbean Cruising From Less Than $38.00 Per Day! Caribbean Cruising From Less Than $38.00* u.s.d.Per Day! Who says you can’t afford to treat yourself to a cruise. Room, Meals & enterainment from less than $38.00* u.s.d. per day. Sail from Fort Lauderdale to the Eastern Caribbean, 7 nights of island hopping. * Based on double occupancy in lowest cabin category, fares do not include fuel supplement, if any, Govt taxes.